On this day in 2004 Tullycraft and Camera Obscura played at Neumos in Seattle. After the show I was approached by two guys introducing themselves as Charles and James. 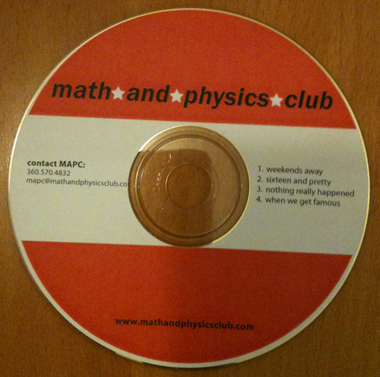 They handed me a demo EP of their new band Math and Physics Club (see photo). Little did I know that this band would soon become indie pop stars with fans all over the world. Now, nine years later, Math and Physics Club are about to release their eagerly awaited third album, Our Hearts Beat Out Loud on Matinee Recordings. Check out their new single “Long Drag” HERE.